Klaatu got first place in the final elimination round and had the top two fetches (over the whole trial) in the Open (highest) division of the 2001 World Cow Dog Challenge!!! 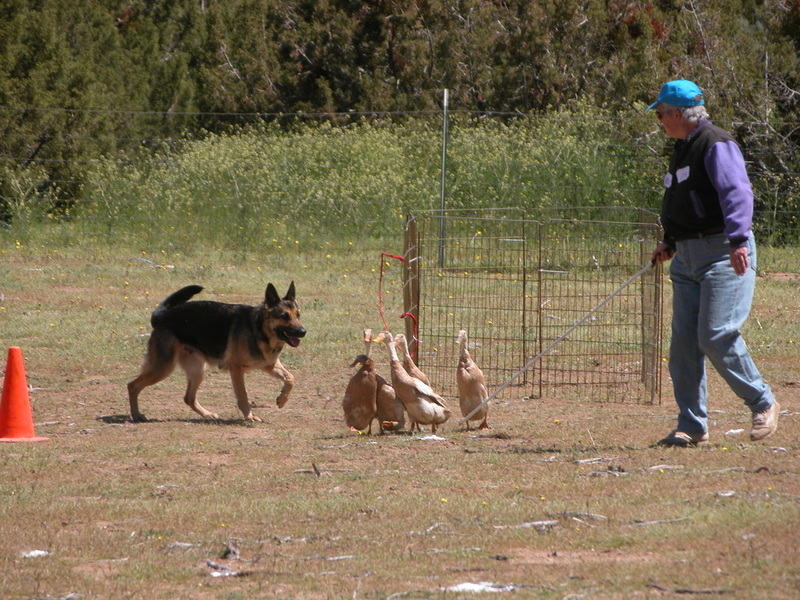 When we arrived, the other contestants with their other breeds said "What's a German Shepherd going to do?" While there, they gave Klaatu the nickname of "Fast Fetch Dog." I got many compliments including: "She's better than the dogs that are SUPPOSED to be cowdogs" & "Your dog is the only one the cows respected." on a variety of courses and stocks. Black & tan saddle pattern, carrying allele for solid black. Etiology (or What’s in a name): Klaatu's registered name is the phrase that saves the Earth in The Day the Earth Stood Still (1951) movie starring Michael Rennie as Klaatu. 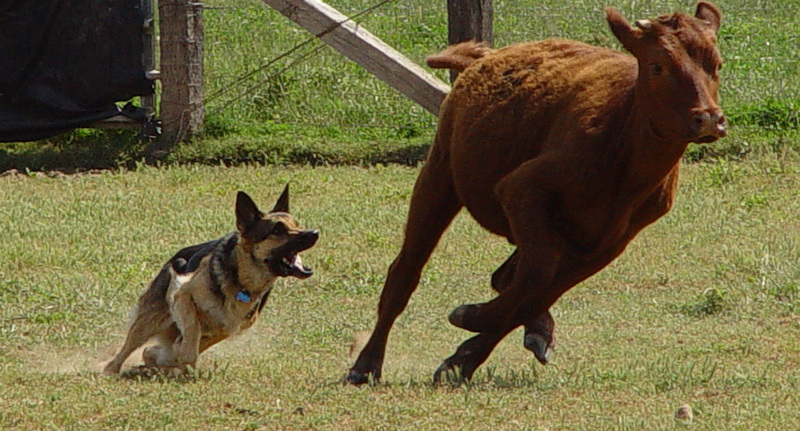 While there were many dogs who outdo Klaatu on sheep especially as she tended to be a bit too pushy with them, she was on a level all her own when it came to cattle. Several called her the best cowdog they had ever seen. Klaatu was very commanding with the cattle. As one fan remarked, when Klaatu tells the cattle to do something, they salute. Klaatu really watched their heads; She had no trouble keeping together cattle that did not like each other. No matter the stock, Klaatu always knew where to be. When she "got ahead" she would come in with an abrupt pivot stop that would stop the cows cold. Her heel bite wasn't at all low, but it was always so perfectly timed that she was never in any danger of getting kicked. Klaatu was also an extraordinary duck dog. Unlike with sheep, she was not at all pushy on ducks, but worked them with lots of rate and was very good at covering them. Though she had a very hard bite on cattle, when ducks disrespected her, the discipline grip she gave was very gentle, carefully measured as to not hurt the duck. Klaatu was of very athletic build. Had a true endurance trot. Even impressed the judge during her AD (breed endurance test) as she was not even breathing hard, whereas the other dogs in the test were huffing and puffing. Would tuck and roll and then come out of it into a run. Could jump a 5 foot fence from a standing start. Would pivot on both her front and back. See the photo at top of page for example of her pivoting on rear. In December 2003, Klaatu received major head trauma which resulted in some coordination problems and her left eye pushed into the socket . Especially affected is her run gait. She could no longer run very fast (she used to be a speeding bullet) and tired easily, especially on uneven terrain. Despite her coordination problems, Klaatu earned 10 more titles and even HITs and a High Combined after her head trauma. Though Klaatu did seem to have problems hearing clearly at a distance, thus we weren't able to get her all her B course titles. As she got older she became less and less interested in livestock. She retired from trialing in early 2006. Including all superseded titles, Klaatu earned a total of 66 titles. 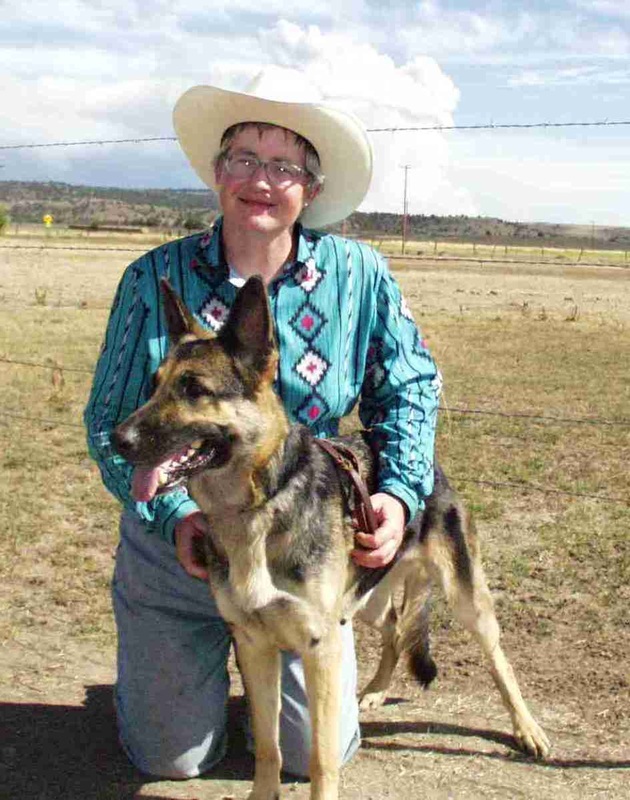 Klaatu earned every ASCA stockdog trial title available during her career. (FTD wasn't introduced until after her retirement.) Klaatu earned all AKC herding titles except HXBs and all B cattle. She had also earned every AHBA title available except she didn't have any geese titles. This is because geese weren't ever offered back then. I raised up some geese to achieve my goal of getting all the AHBA titles. However, between her head trauma and AHBA adding HTAD as well as turkey titles, I gave up on that goal. However, my efforts did succeed big time in getting goose trials going. For instead of geese being awful to run on as people had feared, we discovered they actually to work much better than ducks. Klaatu's Facebook album Alas, you may not be able to view it, if you don't belong to FB.